My name is Stallone Collings Joseph Phiri. I come from the central region of Malawi. I happen to be the first born in a family of four children and we were all raised from a Christian background. My father’s occupation is fishing, whilst my mother is a housewife and a farmer. The life that I have gone through taught me to be strong and never lose hope. I completed my secondary education in 2012 and tried to apply for higher education but was unsuccessful. I started fishing, following the footsteps of my father. Though I was involved in fishing, the inner core of me was not satisfied, because I really wanted to continue with my studies. In 2013, two unforgettable events happened while on duty as a fisherman. The first time I was caught up in a storm with my father whilst in a boat fishing. It was the strongest storm ever, but with God’s grace, we survived. The second time it happened I was alone, which made it even worse and more difficult for me to manage the storm until another fisherman came and rescued me. Having gone through the hardships of fishing, I gave up this role and moved to the Northern region of Malawi to start afresh. There I started working as a houseboy. The person I was working for saw how well I had done my studies and encouraged me to apply at a nearby college where I began to study a Diploma in Accounting. Unfortunately, this programme only worked for one year and I stopped due to financial issues. In 2016, I returned to Salima where I found a job as a waiter for two years at Blue Zebra Island Lodge. But through it all, I never gave up my dream and I never forgot God. I trusted in Him that one day I was going to attain higher education. I then met Kingsley Chimaliro, a third-year student at African Christian College. He introduced me to the college and told a lot of good things about it. The moment I got enough information about this school, I applied and the results were so appealing. I was so glad to be accepted. My dream is to major in Organisational Leadership. This is because the world needs young and energetic leaders who are deeply rooted in the Word of God. As a leader, I would like to bring practical and lasting solutions to the challenges affecting our continent today. I am looking forward to being molded, equipped, and transformed into a visionary leader who can transform people’s lives for the better thereby glorifying the name of God. Last but not least, I would like to express my gratitude by thanking everyone who was involved in making my processes and journey to the Kingdom of Eswatini possible. Only God knows how to bless you abundantly. God is able and is there to transform and change our lives for the better. 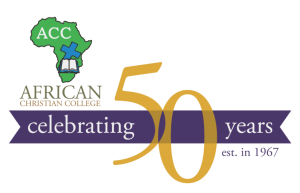 I was always praying to God to open a way for me to further my studies and here I am today at African Christian College. If God answered my prayer, He can yours. Trust and never lose hope to stay focused and keep knowing that God’s time is the best.